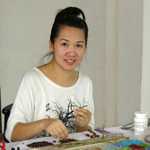 Jewelry artisan Sirada designs a stunning bracelet. 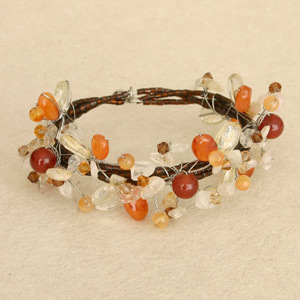 Threaded by hand on stainless steel strands, it features carnelian, citrine, quartz and glittering glass. The bracelet wraps about the wrist for a custom fit. Materials: Carnelian, citrine, quartz, glass and stainless steel.